Fake News is Real - Fact or Myth? Fake news is a thing. The 2016 election cycle aftermath included an idea that “fake news” had been circulating on social media and had swung the election. 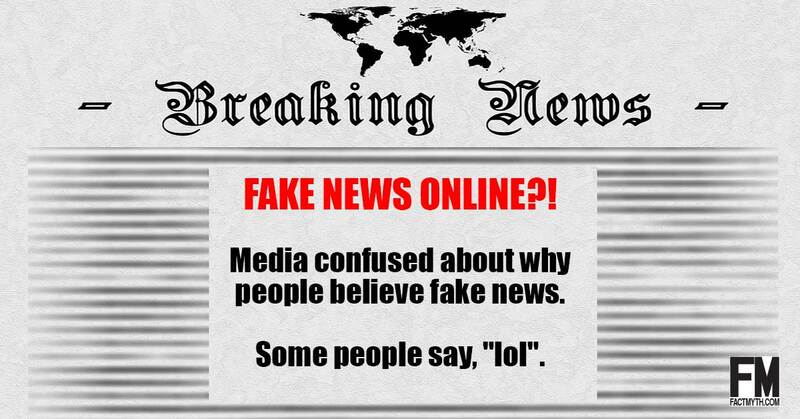 In order to consider that idea, we have to have a definition of fake news, the problem is that this broad and vague term doesn’t have one meaning and has been used in a few different ways. In general, we can say “Fake news” is information, presented as news, meant to influence rather than to provide pure information. The problem is this general definition covers everything from “opinion journalism,” to “slanted or biased news,” to completely made up stories with no facts (and with its only purpose being online propaganda and clickbait). Another problem is that the term “Fake News” has itself become an insult. A name to call any news we don’t like, often meant to slander a whole broadcasting network. Certainly we have to be able to distinguish between purely false information, biased information, and a propaganda term used to tarnish a brand. If we can’t differentiate between CNN and some dot-whatever cite with a purely made up story, then the term “fake news” is essentially a nonsense term that has no value outside of its propaganda value. So then, let’s say “fake news” is a broad category meant to denote everything from actual fake news, to slightly slanted or biased reporting, to propaganda, and what we are talking about depends on context. In all these respects, in terms of bias and totally fake news, both are real and as old as the printing press. Sometimes, more dangerously, information that doesn’t fit into the narrative of the accuser is labeled as “fake.” This is where things get complex and slopes get slippery. If a right-wing news source says half-truth X, and a left-wing source says half-truth Y, then accuser A says Y is fake, and accuser B says X is fake… at that point citizens are likely to turn to alternative media to discover the truth. On one hand it is simple, there is fact, then there is opinion on fact, and then there is half-truth, and then there is lies. If these are labeled properly, it is simple. If they are all conflated together and then this is made more complex by accusations, we get a confusing environment (a cluster fuss). The 2016 election cycle was a cluster fuss, but so were the elections of the 1850’s in America and the 1920’s in Germany. This isn’t a statement on specific factions, but rather a statement on emotions and journalism colliding in a politically divisive environment. BOTTOM LINE: Fake news is a newly coined term with no specific meaning. It generally means either “bias news” or “news a made up story with no grounding in reality” (in both cases the word “news” is used lightly). Stories may be created purely to get ad revenue by stirring up emotions or swaying opinions. Twisted truth, misinformation, and half-truths sprinkled in with opinion do not constitute ” truly fake news” (AKA complete falsity) instead they denote that which should be labeled as opinion presented as news. This mixture is a journalistic combination of biased opinion mixed with sensationalism and propaganda. Real news is anything that follows high journalistic standards and makes a reasonable attempt to inform with verifiable facts, ideally stating both sides of the argument and clearly denoting different forms of information. Sometimes real news drops the ball. It might be tempting and appropriate to call such news “fake,” but using derogatory labels such as “the lying press” can send us down a slippery slope. We have a right to hold news reporters to higher standards so that the American press remains able to report verifiable facts. The mainstream media sometimes fails to label opinion accurately, uses questionable talking points, and seeks advertising and ratings. Nevertheless, instances of good reporting occur on Fox, CNN, NPR, NBC, etc. on any given day. We ideally shouldn’t be confusing some bad journalism, with truly fake news sources who purpose is something other than “to inform”, but this common language term is here with us now none-the-less. TIP: Early fake news included the myth of Spanish Inquisition in which Protestants tried to slander Catholics. This is not the first time people have been bombarded with counterfeit information. We are in serious trouble as a nation when we don’t understand INFORMATION, AND ITS COUNTERFEITS: PROPAGANDA, MISINFORMATION AND DISINFORMATION. Here we have to differentiate between slanted views and talking points. These are just as likely to appear on Fox News or NBC as they are from alternative sources. They may be evident on alt-media like InfoWars or the Young Turks, and the bogus websites that make false or mostly false claims for click bait, which also appear on alt-media. In some ways, “fake news” from alt-media is no different than which mainstream sources present as “news” on a daily basis. It is truth cut with talking points; it contains omissions and speculation. It tries to weave its narrative around talking points first, and inform second. The alt-media pushes back against this. On the other hand, “the lying press” presents issues that stretch back for centuries. The NAZIs adopted the term to describe the media in their day as a deflection tool and part of their propaganda program. Thus, we need to take two steps back and give a closer look to alt-media “fake news” with its propagandist elements and the major media’s propaganda. Given perspective, we can see that, even when Fox News, NBC, or The Wall Street Journal drop the ball, it is not the same as when alt-media flagrantly lies. For one, journalists, even in this modern ad-and-click-driven era, have a code of ethics and standards. They are a vital organ of the nation. Alt-media is not; they are ordinary people taking journalism into their own hands, often without any training or commitment to fact checking or discovering the verifiable truth. This doesn’t make one media type better than the other, but it does show us a difference. It shows us that we have to consider each type of source differently, and we have to be aware that what we perceive as real can be fake. The trick to consuming all forms of information is understanding the difference between verifiable information or reliable news and counterfeit information or fake news. “True news” is grounded in cold-hard-fact and meant to provide real information. It gives both sides of a story. It has citations. You can check it. It can hold up to scrutiny over time. Meanwhile, propaganda is designed to convey emotion, not information. Propaganda and fake news don’t seek information as their ends. They seek to influence and indoctrinate you with a narrative. TIP: See types of truths. Most of the media, whether it is alternative, mainstream, junk (with a few articles, segments, and outliers aside) can sometimes seem to spread more propaganda than fact when dealing with emotional topics. It isn’t that they don’t have any facts, but, in the heat of the moment, the point of the message becomes less about truth and more about talking points. Sometimes the alt-media flies in the face of this and puts out more facts than the mainstream media, sometimes it flies the opposite direction and uses damaging propaganda. If our military ran like this we would be in trouble. Imagine a field guide that full of emotional nonsense! If a company ran like this it would fail. Imagine a company that only tried to fool their audience rather than provide substance. ENRON, for example. We disgrace good journalism for our deeply ingrained two-party political bias. This bubble and frame politics is bad, and the corresponding opinion “journalism” is wicked. Where a doctor has HIPPA, a modern journalist seems to have little more than a talking point designed to sway 50% and enrage 50% on the nose. We need to know the bias of the news sources that give us information. Fox News is right-wing news; NBC is left-wing news; RT is Russian-state news; Democracy Now leans left; NPR leans left; PBS leans left; Cato leans libertarian; Wall Street Journal has a bias toward markets. Bloomberg, Washington Post, New York Times, etc. all have biases. Why in, “the name of reason,” wouldn’t we expect people to seek out “alternative news” like Alex Jones or Young Turks. Thus, the left goes to Wikileaks; the right goes to Breitbart. The right goes to Blaze; the left goes to Anonymous. None of these well-intentioned alts hires people with degrees in journalism. In addition, the number of sources we have access to has grown exponentially along with the internet. We are bombarded with so many potential, often unverifiable, truths that we become confused. Now we are in real trouble. I saw it coming in 2001; we all did. Daily show did, but we did nothing. We have Mainstream media half-truths mixed up with alternative media half-truths with Reddit-based conjecture thrown in. The alt-right and alt-left weigh in, meme, and share while social media like Facebook reinforces the loop and shows us more of what we want to see. There is real money in this. It isn’t just mainstream media who gets the ad dollars, today it is anyone who can attract attention. The true-fake-junk-news trolls come out of the woodwork; I wake up to relatives sharing a racist garbage headline with no story attached to it while I work to write up real stories, with verifiable information, and reliable sources next to which I place my opinion. This nightmare scenario, spawned by our gazillion dollar media industry IS a problem. However, what we should not do is use #PizzaGate as an excuse to not care about the Podesta emails that mention Pizza. Someone might just think, “wait, are they using an incident in D.C. to deflect the public from looking at email?” The American Media favored party politics and talking points over solid journalism, which created a vacuum that was filled by propaganda. Now, to be clear, I do not think #PizzaGate or #FakeNewsGate is a mass conspiracy. I think we all (from the top of politics, to intelligence, to the average Joe, to Alex Jones) have become sidetracked. The problem is when we all cry wolf, and cry wolf, and cry wolf, we have a hard time rallying our 320 million when an actual wolf is coming. When every media story is sensational, we forget that information isn’t always exciting. For example, going through the Podesta emails, one can’t help but realize that Hillary had nothing to do with any of this. Very few read the emails and, worse, no media outlet reported on them. While NBC screams “fake news”, their target audience is out watching alternative media. Here is what a site that says it is anonymous says, what Alex Jones says, etc. Errors compound over time if it not combated with facts, information, and solid journalism. Donald Trump IS Getting Daily Intelligence Briefings: FAKE NEWS Is WRONG AGAIN. I research facts for a living, so I can pick apart what is well intentioned Alex Jones, what is honest Alex Jones, what is conspiracy minded Alex Jones and then compare that to my well-researched information. In this I learn a bit and understand his character better. But if you just listen to him as though he presents only facts, you are getting some half-truths. The major media outlets do the same thing, and this is the problem. TIP: Notice how Alex Jones is highly emotional, attempting to be frank with his audience, but presenting half-truths and a slanted viewpoint. Does this remind you of much TV news? Journalism: Last Week Tonight with John Oliver (HBO). Let us look to as good as source as any, John Oliver for a summary. Fake news is real, but correcting the problem starts at the top. I don’t blame the Alex Jones’ of the world, I blame the Foxs and NBCs. There is still a lot of excellent journalism out there, but opinion is constantly presented as news and hard-hitting information-based journalism is very often passed over for popular soundbites. This slippery slope has had real world consequences. Logic, cross checking sources, and critical thinking. We all have a built in fake news buster, just gotta put logic before emotion and step in the other side’s shoes. Very well done. I think that this piece does an excellent job of identifying the problem and the use of the John Oliver piece was fantastic. I wish we could add something to the water like fluoride to make people smarten up and support good journalism. I have to wonder how many people actually take the time to view the citations.